The Automatic Tire Inflation System from PSI is in comparison to all the "Tire Monitoring Systems" an ACTIVE system which keeps the tire, at all times, at the ideal pressure and even inflates the tire while moving. 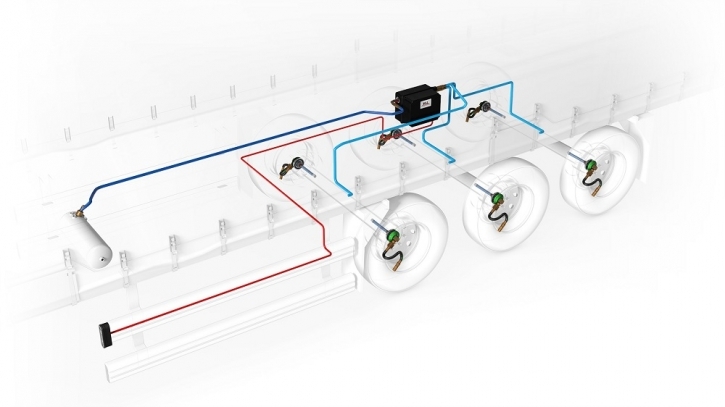 As a result (1) the fuel consumption improves, (2) the lifespan on the tires improve, (3) avoids almost all blowouts, (4) increases the overall reliability of the trailer significantly. - Reduces the fuel consumption of the truck, by optimizing the roll resistance of the tires. - Increases the lifespan of the tires significantly, by maintaining the ideal contact surface between the road and the tire. - Prevents almost all blowouts (collapsed tires). => Due to the fact that 90 to 95% of the blowouts are caused by small leaks (slow/micro leaks) and the PSI system compensates (inflates) these leaks, they will all be prevented! - Increases the reliability of the vehicle. => Due to the fact that the vehicle is not immobilized anymore due to tire problems!